The Grand Journey is brought to you by Microgaming. It offers 30 paylines over 5 reels and includes a number of exciting slot features to help push your way to the top. The game is based around the ancient Mayan civilization and includes symbols that will take you back in time to a day when the Mayan warriors rules the land and their vast empire was considered the best man had seen. You will find many exciting symbols in the Grand Journey and those include a tiger, volcano, temple, Mayan female, scenes from the jungle and more. The game includes a few bonus symbols along the way such as some gear for exploration and the Grand Journey symbol, which acts as the wild in this video slot game from Microgaming. The nice side to this release is it includes various animated graphics that will see your enjoyment levels increase. The sounds are fantastic and truly take you on a path into the sounds found within the jungle and the sounds the symbols represent. Look for things like lightening, pitch black ominous clouds and more to add to the sense you get playing this slot. The game will allow you the choice to play as little as one cent per line or as much as 2 cents per line. As you are able to play as many as 20 coins per line and the game offers 30 lines that means you can wager up to $12 per spin which make The Grand Journey a game that allows low rollers to make max bets and achieved some incredible results. Microgaming has done outstanding with this game as it suits a large spectrum of players like/dislikes and betting preferences. Read below learn more about some of its games features! The Grand Journey is what you really want to see as it is wild and can cover each reel entirely! This can result in seeing the maximum payout on all 30 lines! It will also see you jumping for joy at such huge winning potential and the added possibilities that a stacked wild symbol can offer. The added touch is that it will double your win as well meaning you have the potential to win the max payout times two! The game includes free spins. You can win 15 free spins each time to see three of the scatter symbols across the reels in any position. 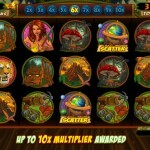 The nice part to the free spins is they also include a multiplier that will increase with each of the free spins. Even better is that the stacked wilds are also in play! This can return some massive wins and see you running to the bank, going on vacation and maybe buying yourself that dream sports car and more. The only thing to remember is the free spin multiplier only will go up to 10 and not 15 but when you consider the potential it is still a very generous bonus features and is designed to make each and every free spin as exciting as possible. Make sure you add this game to your list of must play slots! Visit a MicroGaming casino today, make your deposit and start spinning those reels!